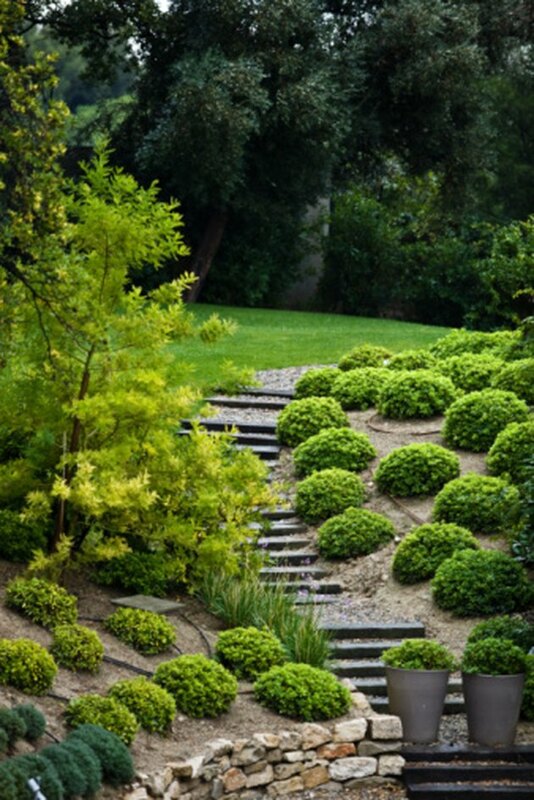 Build in-ground steps in the natural slope of your garden or yard to soften the landscape and make the area more accessible. A sturdy building material, landscape timbers blend well with any surrounding to enhance the charm and appeal of the spot. Functional steps made with landscape timbers add character to the area and provide a stable footing over hilly turf. Making landscape timber steps is a straightforward procedure that does not require any special skill or expertise. Landscape timber steps soften an existing slope in your garden. Cut an 8-foot long landscape timber into two 4-foot lengths with a chainsaw. These two lengths are called step tie-backs. Measure and cut another landscape timber, called the tread timber, as long as the step's desired width. The three lengths form one step. Repeat the process to make the desired number of steps you need for the stairway. Join the three lengths for each step to form a U-shaped structure. Place the tread timber on an even surface, and position a tie-back at each end to form a large "U". Drill two 3/8-inch pilot holes through one end of the tread timber that penetrate the tie-back timber and join the two lengths. Repeat the procedure on the other end. Pound 10-inch long, 3/8-inch nails through the holes with a sledge hammer until their tops are level with the surrounding timber surface. Join the remaining tread timbers to tie-backs the same way. Hold a 4-inch long angle brace at an inner corner of one of the U-shaped structures, and secure it with galvanized bolts. Repeat the process to join a second identical brace to the other inner corner of each U-shaped structure. Dig 4 feet back into the soil at the base of the slope where you want to insert the steps. Use a shovel and dig as deep as the step depth. Position the first step in place, checking that it is even with the surrounding with a carpenter's level. 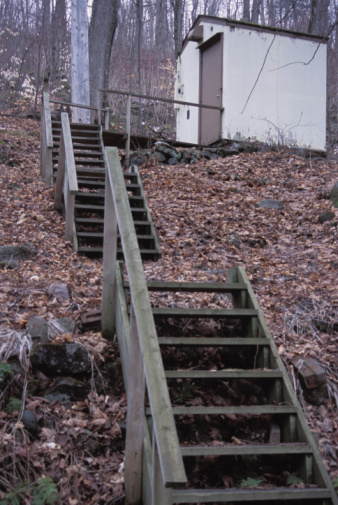 Although this base step is not visible, it serves as a stable foundation for the stairway. Lay the second step directly over the base step. Align its edges so it lies directly on top. Join both steps with 10-inch long, 3/8-inch nails spaced evenly apart. Place the third step directly over the tie-backs of the second step, positioning its thread in the selected spot. Angle the step if you want a curved stairway. Make sure the step is level before inserting two 10-inch-long, 3/8-inch-wide nails over the ends, one at each corner. The nails penetrate the tie-backs of the previous step--the one directly below--to join them together. Drive additional nails every 1 ½ to 2 feet if the tie-backs are long. Repeat the procedure of joining each step to the previously installed one until the stairway is complete. Pour pea gravel, soil or concrete into the "U" of the steps to hold the stairway in place.